Our floodlit indoor arena was converted in early 2014 and is approx 24x42m. 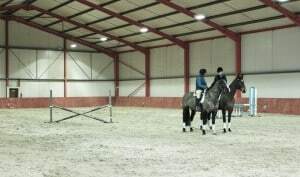 There is a full set of safety system jumps available for us in the arena, which are bright and light for ease of use. Please check our booking page for information about availability and how to book. Exit the M90 at the Bridge of Earn Junciton 9, then take the A912 signposted Glenfarg. At the end of the long straight is a small roundabout, turn left on to the A913 towards Abernethy. The farm road is the first road on the left hand side, just before the cottages in the village. Follow the farm road, there are passing places along the road, and then you will see the sheds infront of you.